Please support independent journalism. Help pay for Citizens’ Media TV. In our calculation, we did not consider official district events occurring before the school year, such as summer school. We also did not consider district employees that work in the high school building at all times, such as main office, maintenance, and janitorial staff. During the school year, teachers are contracted to arrive by 7:15 AM and leave no earlier than 2:30 PM. However, teachers commonly go in early and stay late, and also prepare their classroom sometimes up to a week before the school year begins. Many daily reports do not include the hours during which work occurred. A significant amount of daily reports are simply missing, particularly during the first month of the school year. Work occurring during school hours (specifically during the months of September and October) has already been acknowledged through public statements made by numerous parents, the project management contractor, and all fifteen teachers whose classrooms are located in the “D wing.” The roof on top of the D wing is where the most asbestos containing material was detected. 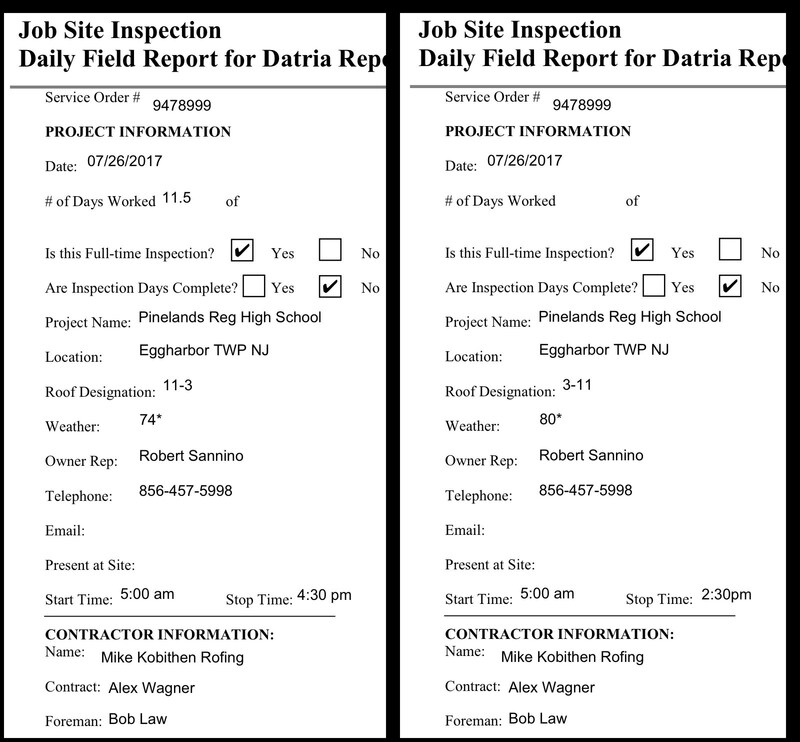 Regarding the project management company: In this article, Chuck Romanoli of New Road Construction, the company tasked with supervising the entire project, openly acknowledged a contradiction: First, that students were in school and the ventilation system was required to be open and on because they were in school. And second, that construction was indeed occurring on the roof during this time, despite the fact that the ventilation system is required to be closed and off – and that the school must be completely unoccupied – at all times while work is occurring on the roof. There are 15 certified teachers that were assigned to teach in the D-Wing for the first quarter of school-year 2017-18. Each and every one of them contributed to the content of this statement. After reading the above statement, unanimously the teachers agreed that the content is true, and that they wish to have it read at the Board of Education meeting on December 13, 2017. 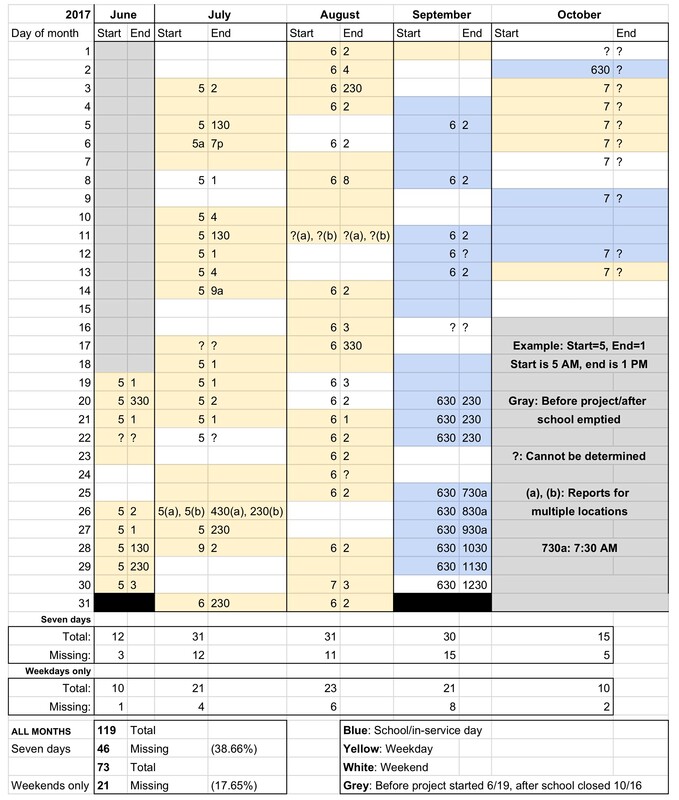 This information was discovered by cross referencing the district’s 2017-2018 school calendar (original link) and facilities use requests with all of the start and end times as documented in the contractor’s daily reports. An example of this overlap is next section.